Karim Benzema may be one of the more under-appreciated strikers in the world of football. The Frenchman is firmly ensconced in Ronaldo’s shadow and is seemingly satisfied to play the supporting role to the phenomenal Portuguese International. The question is how much do Real, or perhaps more pertinently Ronaldo, need the French International. Venkatesh W.S. and Karthigeyan K. dissect the numbers. Real Madrid is the place where the best in the world of football want to be showcased. Real Madrid as a football club has endured two Galactico eras when the dazzling stars of world football graced the La Liga with their dancing feet. 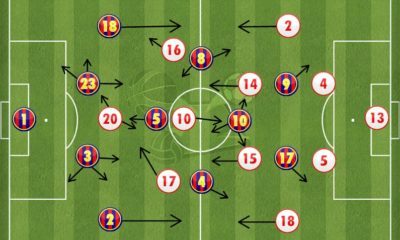 But not all has gone according to plan for the Spanish giants. Some of their supposed world beaters have turned out to be no- shows, while some have been called over-priced and hence over-rated. But there are a few individuals who have exemplified the Galactico principle, proving to the world that talent and fame can survive in a symbiotic relationship. One of them is none other than Cristiano Ronaldo. Since Ronaldo joined Madrid, an average of 152 goals per season have been scored by the Los Blancos. Ronaldo has been responsible for 34% of the goals scored during this period, which accounts for about 313 goals. Taking nothing away from him, we believe that such ostentatious show of numbers would not have been possible if not for another Galactico who arrived at the Bernabeu along with Ronaldo. We call this rather obscure but equally important part of the puzzle as Karim Benzema. This article is our response to the imprudent rumors linking Benzema away from the Bernabeu faithful. For the purpose of analysis, comparison of the performances of Ronaldo with and without Benzema against the same opposition has been done. It is startling how much of Ronaldo’s on field exploits depend on the presence of Benzema. The graph above clearly shows that Ronaldo’s inclination to shoot is hardly dependent on those around him. It is his accuracy that takes a hit without his strike partner. 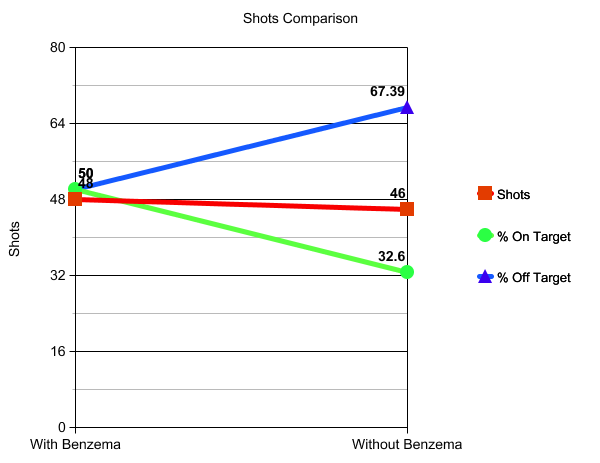 Without Benzema, 67% of the shots go off target. That is a rise of around 17% from with Benzema. Ronaldo averages around 3.9 shots/game away from goal without Benzema. This average is only around 3 shots/game with Benzema in the side. Looking at his on target accuracy, Ronaldo’s game improves by around 18% with Benzema. It wouldn’t take a genius to realize that the 18% increase in the off-target shots has been directly compensated by the 18% decrease in the on-target shots when Ronaldo plays without Benzema. Benzema’s tendency to drag defenders towards him provides the ideal foil for Ronaldo to have time on his hands to let fly with accuracy. Without him, the opposition defenders crowd Ronaldo’s line of sight and force him to have wayward attempts at the goal. As the old belief goes, the more shots you have on target the more likely you are to score. This case is no exception. Ronaldo scores 120% more goals with Benzema in the same number of games against the same opponents as compared to without him. Putting this into perspective, without Benzema, Ronaldo’s tally of 313 goals since arriving at Madrid would have reduced to a paltry 156 goals in 6 seasons! A deeper look at the goals scored by Ronaldo in the company of Benzema indicates that Ronaldo scores more number of goals from open play, around 63%, than without Benzema, a meek 40%. 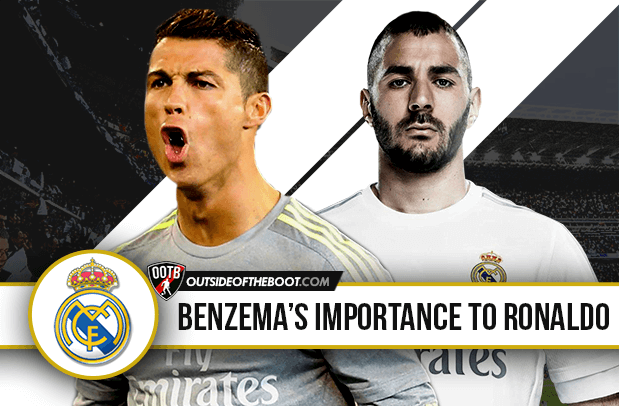 It is understood that with Benzema playing, he is the first line of attack amongst the BBC trio. As a result, during swift attacks, Benzema receives the ball, holds up the play and attracts defenders towards him. This allows Ronaldo to take up dangerous positions in the opposition penalty box, allowing him to score more from open play. Without Benzema, Real look more towards Ronaldo as their first line of attack. This strangles Ronaldo’s ability to look for menacing positions as he loses precious time in looking for a team-mate to pass the ball to or holding up play for his colleagues to join him. 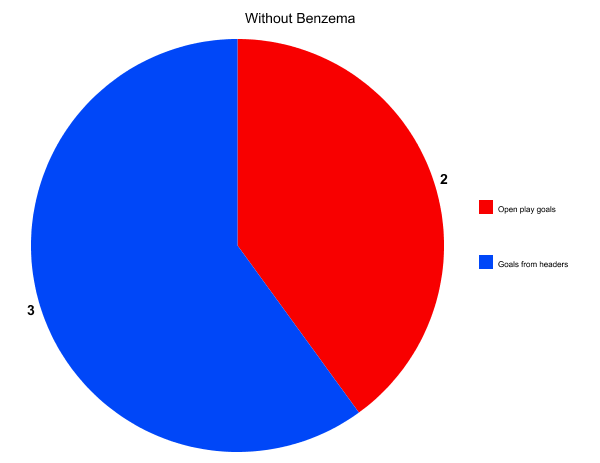 It is clear from the pie-charts that, without Benzema, CR7 doesn’t score many goals from open play and a major chunk of his goals come through headers. This makes him a lone target man for Madrid which makes it even easier to isolate him in the final third. The first leg of the Champions League semi-final against Juventus last season further strengthens these results. Juventus initially fielded two centre-backs Chiellini and Bonucci. 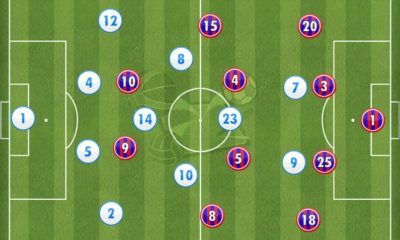 Having acknowledged the fact that, without Benzema, the main threat to their goal was through Ronaldo’s head, as soon as they got the lead, they switched to a 5 man backline with Barzagli coming in as the third centre-back. 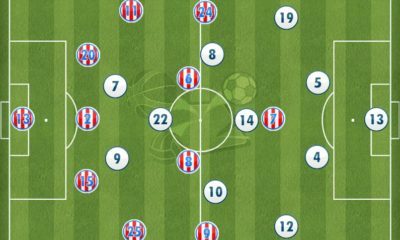 Now with three big centre-halves at the heart of their defense, they successfully cut out the supply of crosses to Ronaldo and managed to keep Madrid at bay. 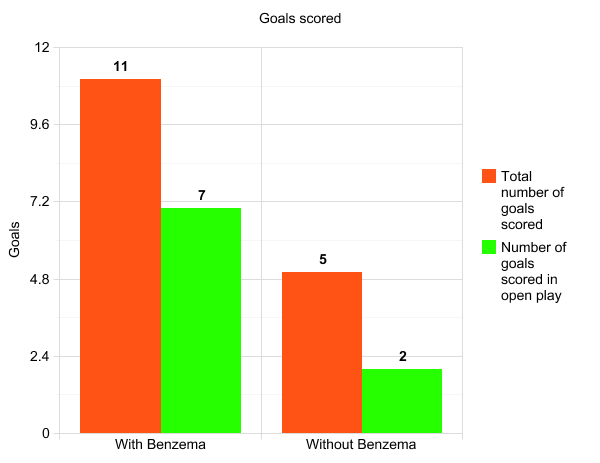 The statistics clearly unearths the fact that Benzema is to Ronaldo what Ronaldo is to Madrid. He is the force that pushes Ronaldo to be the all-conquering juggernaut that he is today. At Madrid, Ronaldo has become synonymous with goals. He has been truly phenomenal in what he has achieved. But the contribution of Benzema has not always been in tacit agreement. People tend to overlook his contribution. This we consider is the reason Real Madrid is always linked with the best forwards in the world, be it Aguero, Reus or Neymar. But will the new No.9 be willing to cloak his contributions and serve the club as well as Benzema has done? Is he willing to be continuously linked with a move away from the club? Is he ready to play second fiddle without ever complaining? It would take more than a splurge of cash to find another Benzema for the Ronaldo Real has. Written by Venkatesh W.S. and Karthigeyan K.
Karthigeyan Kalyan is a Real Madrid fan with an eye for numbers and an aspiring sports analyst.